Renold Hi-Tec Couplings, of Halifax, U.K., will debut a new range of high temperature, marine propulsion rubber-in-compression couplings at the International Workboat Show in New Orleans. The new HTB-MP range is a second generation of couplings based on the existing HTB-GS range. Suitable for use in high temperature applications the new couplings have a blind assembly construction designed for easy mounting inside bell housings. They were designed to operate in only one direction so that half of the rubber blocks will always be driving, or leading, and the remainder will always be trailing. Renold Hi-Tec’s engineers were able to reduce the size of the trailing rubber blocks, as they do little work, and this has enabled the overall size of the coupling to be reduced too. 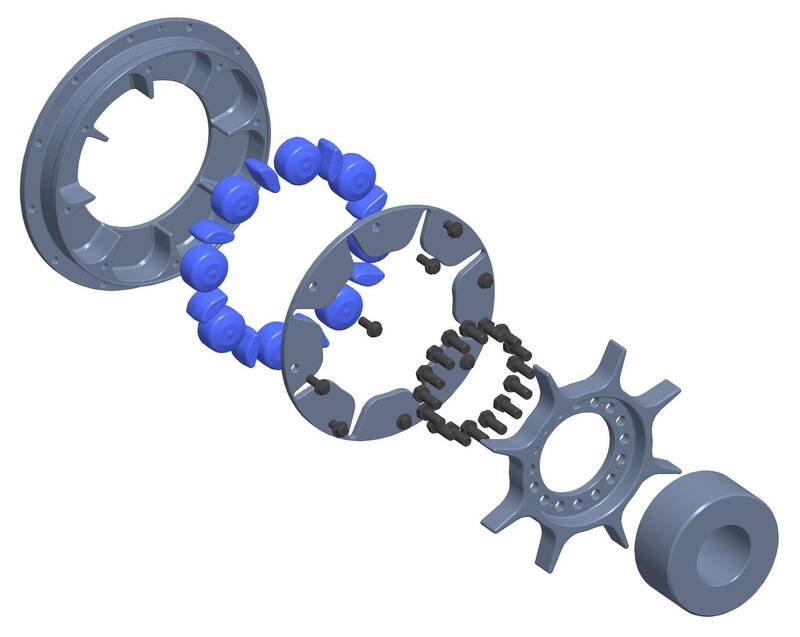 The resulting reduction in the coupling’s weight and inertia decreases the bending moments on the drive shaft. Although the couplings only operate in one direction they can be supplied to operate either clockwise or counter-clockwise. They have interchangeable rubber and metal components, except for the cover that ensures the correct direction of operation. The lead blocks carry all the torque and are specially selected for each application to provide optimum control of resonant torsional vibration. They also provide severe shock load protection from transient conditions ensuring continues operation of the driveline. Once installed they are maintenance free, requiring no lubrication or adjustments. The couplings are designed to work in extreme temperatures from -50 to +200 degrees C. Sixteen frame sizes are currently available for engine flywheels from SAE 10 to 21 and torques up to 53.3 kNm.